The Denver Nuggets 2018-19 season is finally upon us. Media day is less than 24 hours away, training camp will soon follow, and preseason games are just around the corner. With everything ramping up, it is time to take questions and give answers to our readers with the newest edition of the Mile High Sports Mailbag. This question was bound to pop up. Jimmy Butler has been connected to Denver in a multitude of ways, but trading for him right now is not one of them. According to reports by Adrian Wojnarowski of ESPN, Shams Charania and Jon Krawczynski of the Athletic, and Jeff Zillgitt of USA Today, the teams that have varying degrees of interest in Butler are the Milwaukee Bucks, Miami Heat, Portland Trail Blazers, Detroit Pistons, Washington Wizards, Brooklyn Nets, Houston Rockets, Los Angeles Clippers, and — most recently — the Cleveland Cavaliers. The Nuggets have not been mentioned in any capacity. In addition from their omission from the Butler sweepstakes, any deal that Denver can make to obtain a star player will almost assuredly require the Nuggets to send out at least one of Paul Millsap, Gary Harris, or Will Barton with other enticing assets. Considering that Denver feels that their roster could win upwards of 50 games this season, it would be surprising to see them blow up their core for Butler, or any other star, who could potentially just be a rental. I do not see the Nuggets chasing Butler, or any other star player, at this time. Originally, the Nuggets had high hopes for Thomas joining forces with the rest of Denver’s roster. Unfortunately, that optimism has began to dissipate with the realization that Thomas is unlikely to be ready for training camp. Sources have told Mile High Sports that Thomas has still not played with contact of any kind and that he has just been shooting, strengthening his body, and rehabbing his hip. The Nuggets knew that they would have to take things slow with Thomas, but without a timetable on when he will return, the expectations continue to get smaller and smaller. If Thomas can get healthy in time for the regular season, then the expectations will be that he will play between 14-20 minutes per game while acting as the fulcrum of the Nuggets bench unit. Along with carrying the reserves, Thomas could also fit into many three-guard lineups that feature four of the Nuggets’ five starters. There are a plethora of ways to use Thomas, but none of that matters unless he can see the floor. The odds of Michael Porter Jr. seeing the floor this year are different depending on who you ask. The Nuggets organization has tempered all expectations by saying that there is no need to rush Porter back onto the floor after having multiple back surgeries. The Nuggets do not need Porter to be a savior of the franchise so Denver being able to draft Porter with the 14th selection of the 2018 NBA Draft is essentially the organization playing with house money. Denver is already very happy with their young core and they are currently in position to get back to the playoffs for the first time in five years. Because of that, there is no confirmation if Porter will play in any capacity this year. On the other hand, reports coming out of Porter’s camp are saying that he plans to be ready by the start of the season. So, hypothetically, let’s assume that Porter will indeed by healthy by the time that the regular season kicks off in mid-October. If that is the case, Porter will come off of the bench and likely take minutes from Juancho Hernangomez and Malik Beasley as a wing off of the bench. Being that Porter’s back has given him so much trouble, letting him get acclimated to the NBA while playing more small forward than power forward should be beneficial for both the Nuggets and Porter. If healthy, Porter would likely play 12-18 minutes per game as he works back into game shape. He has only accumulated 53 total minutes of action over the past 18 months so getting him caught up to the speed of the NBA will take time. From that point forward, Porter’s advancement and growth would be entirely up to how he produces for the Nuggets. 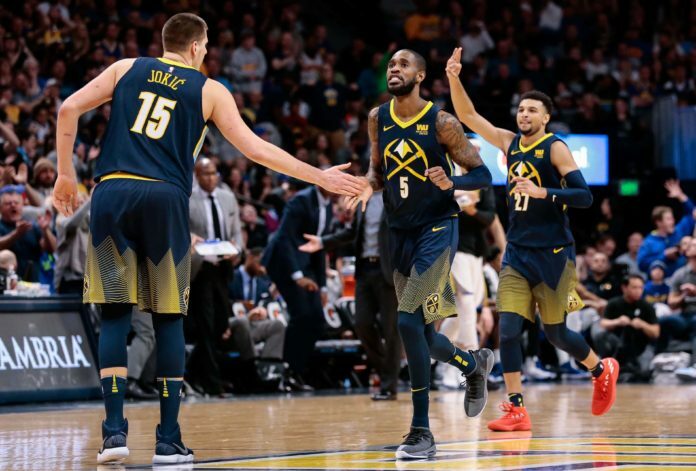 The short answer is yes, the Nuggets are perceived as a much stronger organization than they were five years ago in terms of national respect and among other NBA players. There are multiple reasons why that is the case, but the main one is that Denver has their own young star in Nikola Jokic. Denver has built an equal-opportunity offense that functions at a high level because they happen to have one of the greatest passing big men of all time in Jokic. Other players want to play with a talent like Jokic because it puts them in even better positions to succeed. The other reason is that Denver’s organization has taken massive steps forward from the Brian Shaw era is that their organization is now mostly free of drama and dysfunction. Denver’s head coach Michael Malone is a no-nonsense individual, which has helped in developing a much stronger culture in the Mile High City. In addition to creating a stronger culture, Malone also garners large amounts of respect around the National Basketball Association. He was instrumental in convincing Paul Millsap to sign with the Nuggets and has the respect of star players such as Kevin Durant, LeBron James, and Dwyane Wade. It took a total team effort to climb out of the rut that the Nuggets organization was in, but that does not mean they are finished. To complete the resurrection of Denver Nuggets basketball, they still need more wins and a playoff berth. Both of those goals could — and should — be accomplished this season. This was my favorite question because there is no lack of sneaker heads in the Nuggets locker room. In addition to Denver having lots of players who take pride in their shoes — according to Nick DePaula of ESPN — the NBA is allowing shoes worn during the game to be any color. That is essentially opening the floodgates. With that being said, let’s rank the top-three Nuggets players who’s shoes should shine the brightest this season. Disclaimer: this list only ranks shoes that will be worn during warmups or games. This answer may be slightly biased, but the new basketball shoes by Puma, the Clyde Court Disrupt, are too beautiful not to include on this list. Maybe it is wrong to put a rookie on this list who has not worn a pair of shoes on a NBA court yet, but these are too good to pass up. Yes, Harris is a man of few words, but that is because he lets his style and play speak for him. Harris played in Paul George’s signature shoe, the PG 1, last year. This season, Harris is upgrading to the PG 2 and PG 2.5 and has already shown off one of the color ways that he plans to use. Harris is never shy to wear bright colors. Keep an eye out for Harris to unveil some wild color ways throughout the entirety of the 2018-19 NBA season. This selection may take some by surprise, but soon enough it will be impossible to dismiss Lyles’ shoe game as one of the best on the Nuggets. He has essentially every single color way of the original Air Jordan 1s and would even warmup last season in the Nike LeBron 15 Performance Kith King’s Cloak. It takes a pretty intense sneaker head to warmup up in a $1500 pair of shoes, but that is how serious Lyles takes his shoe game.